I’ll update this later today. But here is robot running a simple avoidance routine on .Net Gadgeteer. In this demo I am going to show how to integrate with multiple external (non-Gadgeteer) hardware devices. In previous posts I have covered the basics of using a single extender module to connect to devices like a Bluetooth module. Here we show that it is possible to use several extenders. This is what I meant when I said .Net Gadgeteer is “hardware glue” in a previous post. 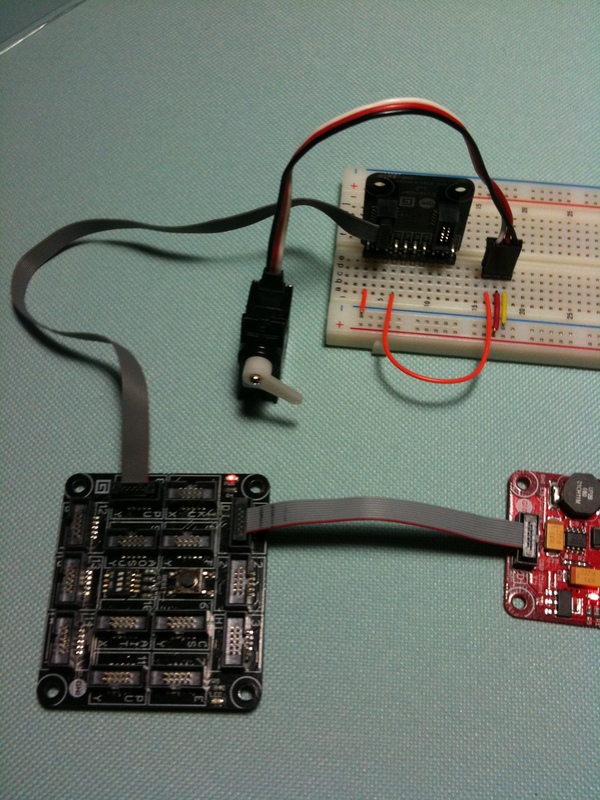 Suppose you wanted to connect a servo and an IR range finder (such as a Sharp GP2Y0A21F9Y) to make a IR radar gadget. I want the servo to sweep the IR range finder across an arc and measure distance. Then I want the results to be displayed like a radar screen. The issue you will run into is that there are no sockets that cover both PWM (needed by the servo) and analog input (needed by the IR range finder). This is a case where you must use multiple Extender Modules. You could create your own extender module too. Just use the Extender Module that comes with the GHI kit have to map the pins with a voltmeter. In this example, I opted to get another Extender Module. Here is what it looks like. Notice that the new one is using a straight header I soldered on. The other one uses a 90 degree header. This gives me more options later when prototyping. //  line(x0, y0, x1, y1); //line takes too long to draw. //using circles instead to show range. //You can use Excel to calculate this function. Note: if you have trouble with the Sharp IR sensor sometimes it helps to put a 30uf cap across vcc and gnd. GHI Electronicswhich is a maker of .Net Micro Framework embedded systems. Seeed (sic) Studio’s .Net Gadgeteer SiteThis is an interesting company that is producting many exciting modules. Sytech’s.Net Gadgeteer Site I haven’t had a chance to get my hands on their boards but I would like to. Arm9 @ 200mhz what isn’t to like? I would like to see how much graphics improve with this board. Mike Dodaro’s Integral Design site where he covers just about all the basics. Pete Brown’s site which has been bitten by the Gadgeteer bug. Pete is well known in the .Net, Silverlight, and maker community. Please feel free to forward other Gadgeteer resources. 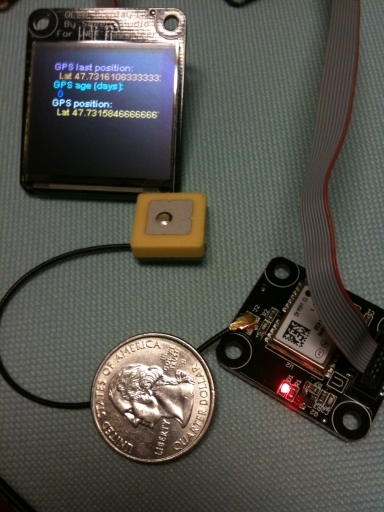 Seeed Studio has released a GPS module for .Net Gadgeteer. In this simple demonstration I am using Seeed Studio’s modules with the GHI’s mainboard with no issues to report. This is one of the really cool things about .Net Gadgeteer; it plays well with others. 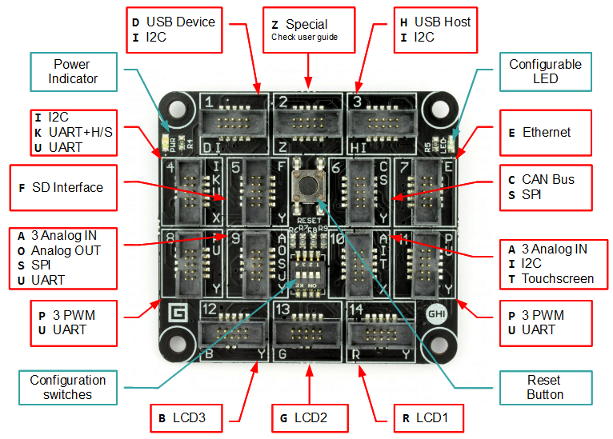 Gadgeteer is like cross vendor hardware glue that forms an eco-system. I will be talking more about that in later posts. 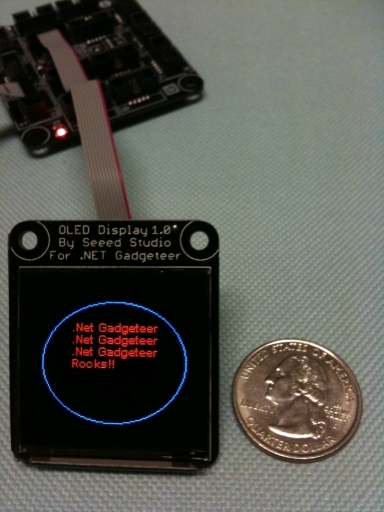 I am using Seeed Studio’s OLED display and showing off its vibrant colors. Also note, I was too lazy to formet the latitude and longitude but in debug I verified it was accurate. According to the modules spec it is accurate to 2.5m. The Seeed Studio GPS module is based on the U-Blox Neo-6M GPS module. This is one of the modules I was hoping to see; a small bright display. While the large 3.5″ display with touch that comes with GHI’s starter kit is impressive, for smaller devices and small robots its too large. Enter the 128×128 OLED. This display is bright and the perfect size for small device prototypes. This OLED will be going on a robot. I am going to review a few more modules that are leading up to building a robot with .Net Gadgeteer. A few days ago I showed how to hook up Sparkfun’s Bluesmirf modules. 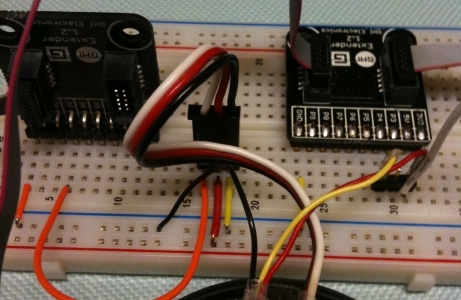 Today, I will show how to connect a servo to .Net Gadgeteer. As you can see the sockets with a “P” have PWM (this would be sockets 8,11). And on these socket’s pins 7,8,9 are the PWM pins. Code below better illustrates this. The servo I am using an older micro servo, Cirrus cs-21bb, but this should work with most servos. The servos ground wire (black ) is connected to the ground of your 5v external power source. 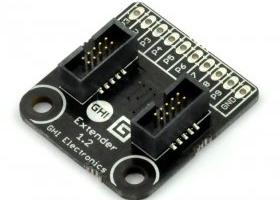 And be sure to also connect ground to the Gedgeteer’s ground pin on the Extender Module. The servos power wire (red ) is connected to your external power source’s positive(+). 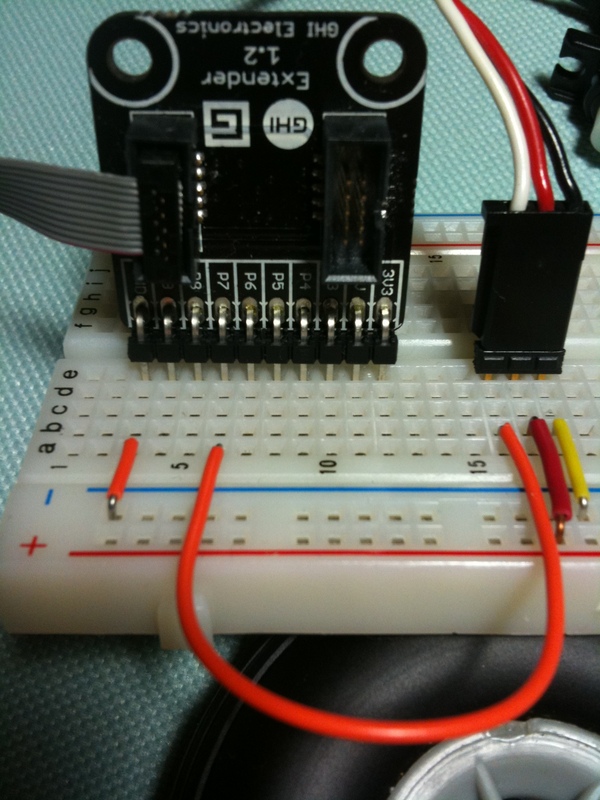 The servos control wire (white) is connected to the Gadgeteer’s PWM output pin which is pin 7,8, or 9. As you can see the breadboards power rail is powered seperately from the Gadgeteer but the grounds are common. It is important that the grounds be common. And that is all there is to it. The class above will move the servo through a range and repeat. Enjoy. In the previous post, I discussed how to connect Gadgeteer to a Bluetooth module. What I didn’t explain was the header on the Extender Module. It may seem obvious to some but the reason the module in my picture has a header is because I soldered one on…even better I had a friend who is better at soldering do it for me. You can buy headers from various electronics supply stores. Digikey, Mouser, or allelectronics which I include a link for simply because they have a picture available. I used a 90 degree header but straight would be fine too. Just depends on how you want the module to be oriented when in a breadboard.